^ Webster , Noah (1913). Webster's Revised Unabridged Dictionary. G. & C. Merriam Co. http://dictionary.x10host.com/?w=ducat. ^ Cuhaj, George S., ed (2009a). 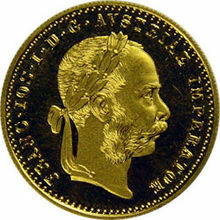 Standard Catalog of World Gold Coins 1601–Present (6 ed.). Krause. pp. 490–491. ISBN 978-1-4402-0424-1. https://books.google.com/books?id=tXSrLbIEDBMC. ^ Friedberg, Arthur; Friedberg, Ira (2009). Gold Coins of the World: From Ancient Times to the Present (8 ed.). The Coin & Currency Institute. pp. 688–89. ISBN 978-0-87184-308-1. https://books.google.com/books?id=TlnoMdZu40UC. Cuhaj, George S., ed (2009). 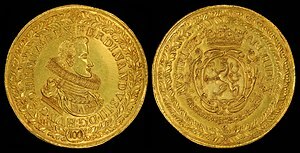 Standard Catalog of World Gold Coins 1601–Present (6 ed.). Krause. ISBN 978-1-4402-0424-1. https://books.google.com/books?id=tXSrLbIEDBMC.